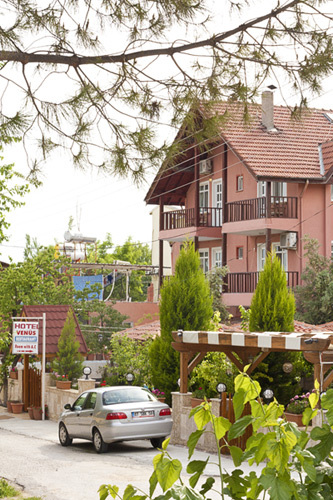 Venus Hotel is a family run hotel with a charming home-like atmosphere, located in the pleasant village of Pamukkale. We have a gardened courtyard, private swimming pool, free internet access, international phone and fax facilities, free transfer from bus station and private car parking available. All our rooms have modern bathrooms with 24 hour hot water, are tastefully decorated and have airconditioning and hairdriers. Two of the floors have rooms with private balconies, with views of Pamukkale's famous traventine and our tranquil garden-pool area, or from others you could catch a glimpse of the picturesque mountains. There is also a comfortable, sunny Ottoman corner, perfect for peaceful reading, or chatting to other backpackers and guests. From our popular restaurant (highly recommended by guests and guide books! ), we provide a large choice of traditional, home cooked meals with vegatarian options and special kababs available. We can easily organise day trips to the many highlights of the area including Aphrodisias, Laodikya, Koklik and Ephesus and have a wealth of extra information on culture, traditions and other travelling within Turkey from the multi lingual owners.